Style has returned to men’s grooming and you owe it to yourself to experience it. At The Hair Shop For Men, we provide an atmosphere where a man can be a man. From classic haircuts to traditional cuts or stop by for a quick clean up between regular haircuts. A big night on the town?, we got you covered. Let us keep you looking and feeling your best. How about grabbing a fine cigar to celebrate closing that important deal or sharing some laughs after finishing the back nine. And remember, our place is your place, so stop by during the day just to say hello, grab a cold beverage, relax in a fine leather chair and check out the latest Duke or Bogey movie on the 60″ flat screen. You’ll be glad you did. And don’t forget gents, we now offer a select service to those getting married! Call the shop and ask about our “Groom To Groomsmen” parties. Treat yourself, best man and groomsmen to quality haircuts, straight razor shaves, gentleman’s facials, food, music and cigars. Let us make your special day even better with a little quality “guy time”. Our latest endeavor is Concierge Barbering. “Let the barbershop come to you”. If you, or someone you know cannot get to the barbershop due to recovery from illness, being chaired or afflicted with Alzheimer’s/Dementia, we will come to your home. Be a part of tradition. Visit The HairShop for Men BarberShop and Shave Parlor today. See why we are Vero Beach’s finest and coolest BarberShop. 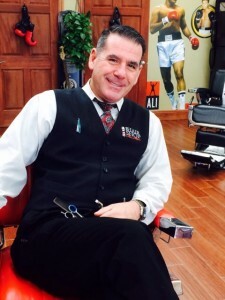 I flew all the way from upstate NY so that I could get a quality haircut at The Hair Shop For Men.Scott,your shop is very upscale and you did a great job on the design and layout.I wish you only the best and I promise not to tell any stories during the time we worked together. Did you get the photo that you wanted from AJ? Let me know if you did not and I will have him send it again. Scott, it was so good seeing you as well my friend and thank you for the kind words about the shop. I posted the pic of you and I on Facebook nd sooooo many fellow workers send their regards and best wishes to you. And thanks for the restraint in storytelling. LOL. I did not get the picture from AJ. I will put in up in the shop! Stay well my friend. Scott it was really great to see you. That was the best shave and hair cut I’ve ever had. I look forward to my next visit. It was good seeing you my friend. Thanks for stopping in and I’m looking forward to the next time. Thanks Greg and we’ll pass on the Cudos to Charlie. I’ve started coming here a few months ago. You guys are professional and very good at your job. The atmosphere of the barber shop is second to none. Very nice and relaxing environment. Thanks Joe for your kind words and we thank you for your business. Have a great 4th of July! My son and I went in today for the first but definitely not the last time. Great haircuts and great atmosphere. All of my guys (ages 5, 15 and 40-something) are loyal clients of The Hair Shop. The boys really love the cuts and current styles they offer there along with all of the hair products and guy-goo (as I call it). My biggest boy loves the straight shave service and has been known to visit twice monthly to have his head professionally shaved as well. The place is well appointed and has and array of skilled staff always ready to get them in and out. Great location, though not for women, and a place any guy would feel at home. Thanks Zach! And we’ll let Charlie know. Thanks Tom and glad you enjoyed our executive Shave. I will let Larry know.